Peter Jones at Edmiston & Company tells me that his central agency for sale, Benetti's 36.6m motor yacht Quest is now sold. Built in 2009 to ABS class, this superyacht boasts a light, airy interior in limed oak designed by Francois Zuretti. MCA compliant, she sleeps up to 12 guests in a master, two double and two twin cabins plus two Pullman berths. 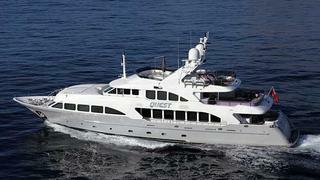 Quest was asking €8.95 million.